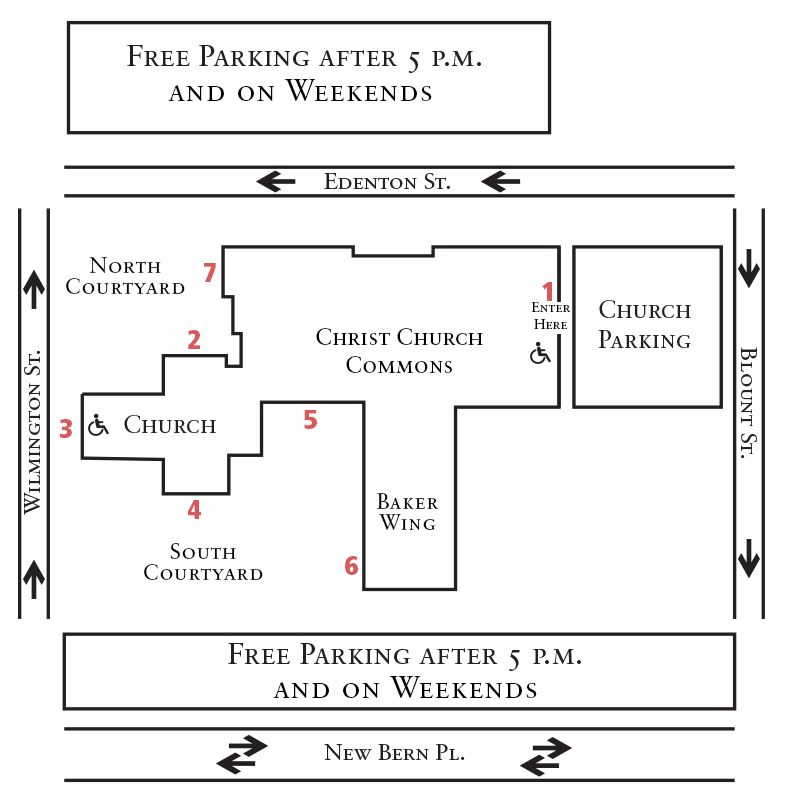 On Sundays, additional accessible parking is available in front of Christ Church on Wilmington Street (across from the State Capitol Building). 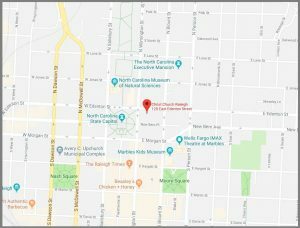 On weekdays, accessible parking is available in our main parking lot on the corner of Blount Street and Edenton Street, and on New Bern Place. Sanctuary wheelchair access is available on Wilmington Street (across from the State Capitol Building). Church offices wheelchair access and access to our elevator, is available from the East entrance (corner of Blount and Edenton) and the South entrance (New Bern Place, adjacent to the playground). Our Parish Hall is equipped with an induction loop system, which transmits audio directly and clearly into hearing aids equipped with a T-coil. Directional signage throughout our facility includes Braille. Large print versions of The Book of Common Prayer are available at all services. Just ask an usher and/or greeter to provide a copy for you. We invite and encourage all to participate in our programs and worship services. Please contact our ministry directors to help our programs meet your family’s needs. Children’s Ministry offers activity bags for children during worship services, including red sensory bags (fidgets, weighted lap animals, and noise canceling headphones), which may be used by anyone. Red bags are available with our usher teams (at each Church entrance) on Sunday mornings.